It’s been an eventful week with the first episode of a whole new season of Sugar ‘n Spice airing on The Home Channel. It’s pretty special because up until now, I have been doing short food inserts on Saffron TV, Great Expectations on Etv and appearing on SABC 2’s MELA! When the Home Channel approached me earlier this year, I was gobsmacked at their offer and thrilled to have my first very own show! Taking it up a few notches from a food insert, it’s taken us 4 months to complete the series and it’s been a roller coaster ride with my family, team and the crew! I have once again been incredibly lucky to work with such amazing people from the Channel….big thanks to Michael Porter and Simphiwe Gamede, the crew…Africa Vezi and Sipho, who tolerated many crazy out take moments, takes and re-takes, and the awesome team at Holi Cow….for the early mornings, long nights, and my long prep sheets! And then, there are those special people who always find a moment in their day to send me a beautiful message of love and encouragement…thanks to my the people out there on Facebook, Instagram and Twitter for the food love and sharing my posts and links…thanks and thanks again! And my family, who I am most thankful for….what you see on telly isn’t just me, you see the team effort with me being the ‘front lady’ and that also includes the crazy make up artist/stylist…Stavroula Georgakis! 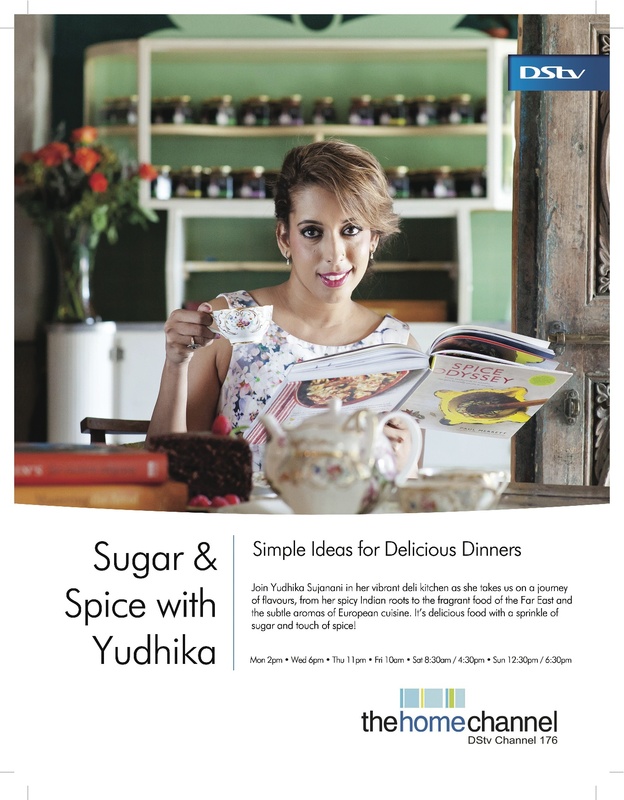 Spar has once again sponsored our ingredients and AMC Cookware just keep me cooking in their fabulous pots! I just realized how big this team really is…it’s huge! 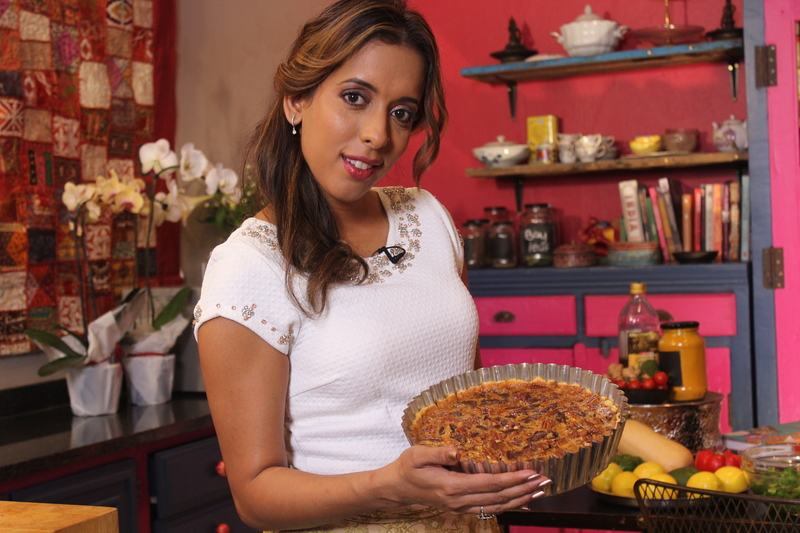 In the first episode, we spiced up old favourites…leftover butternut was recycled into a delicious salad with hazelnut dukkah and prawns, a french chicken casserole got a spicy makeover with saffron, chilli, cumin and coriander…and the classic pecan pie was turned into a chocolately one with dates too! I first made this recipe for Eid last year. It’s fruity, crunchy, buttery and purely decadent! 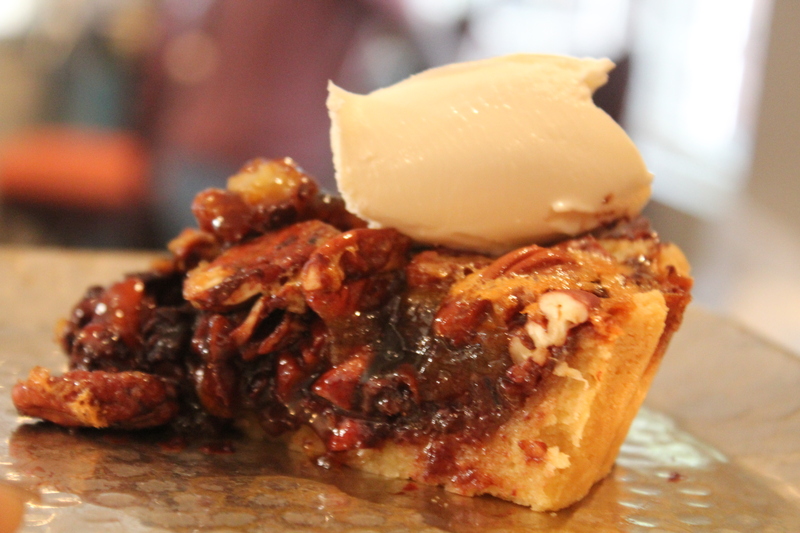 Here is the recipe for pecan pie with dates and dark chocolate. Rub the flour and butter together until the mixture resembles bread crumbs. Add the sugar and mix. Lightly beat the egg and knead gently into a soft dough. Wrap the dough in plastic wrap and leave to rest in the refrigerator for 20 minutes. Roll the pastry on a lightly dusted work surface until it is about 5mm thick and is large enough to line the bottom and sides of a 23cm loose bottomed pie tin. Line the tin with the pastry and press down into the base and about 3,5cm up the sides. Prick the base of the pastry with a fork and leave to rest in the refrigerator for 30 minutes. Place a piece of baking paper over the paper, cover with dried beans and bake blind for 10 minutes. Remove the beans and the paper and bake for a further 10 minutes. Leave the pasty case to cool completely. Place the butter in a 28cm AMC Chef’s Pan, and melt on low heat. Add the brown sugar and golden syrup. Leave the mixture to cool till slightly warm. Lightly whisk the eggs, then add the melted ingredients. 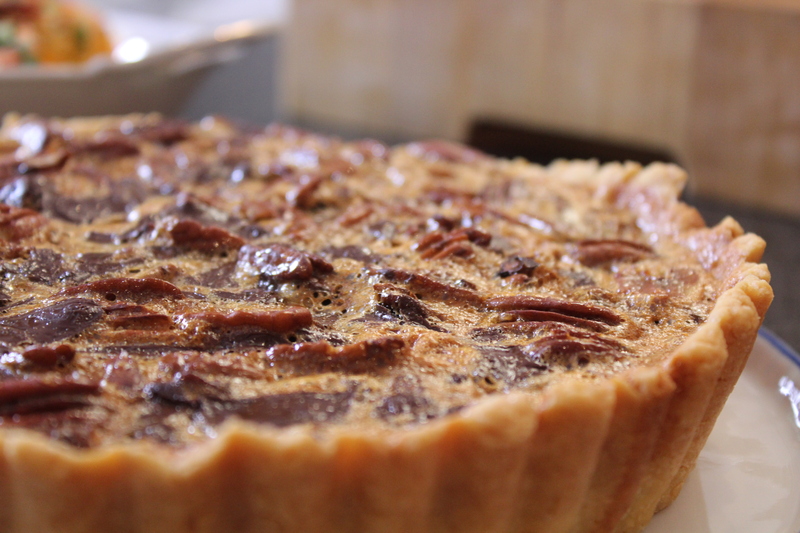 Scatter the pecan nuts, chocolate and dates over the bake pie crust, then pour over the egg mixture. Bake for 20 minutes at 150 degrees celsius, then reduce to 140 degrees and bake for 30 minutes. Leave the pie to stand for a minute and then remove from the tin. Serve slices of the pie warm with whipped cream.